Magic Opener offers you a great range of openers which can be well accommodated with your BBQ tool kit and then can be carried to any preferred destination to enjoy easy and fun evening. 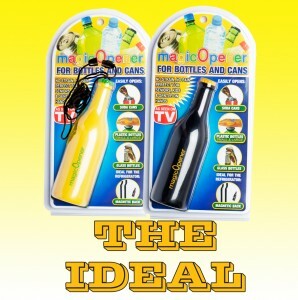 These openers are well equipped to open any kind of bottle top, juice cans, soda bottles and similar bottles. The user need not use his tensile strength to use these cans to open the bottles. They are very user friendly. We at Magic Opener make sure that our consumers get every tool that is used to the best of their benefit and can offer a great support to open different kinds of bottles. Often while planning different outdoor camps etc you might feel the need to keep in an opener in your BBQ kit so that you can have great drinks while enjoying tasty, sumptuous food cooked at the Barbeque which are a real fun when with friends and family around. The seniors in the family may also come across this situation at some point of time where they would feel the need to look for a great opener which can well achieve the purpose of opening the bottles and cans without asking for the help of somebody else. Magic Opener certainly provides for this kind of opportunity where the seniors with problems like arthritis etc too can use these openers anywhere and at any point of time. The openers are well preferred by most of the homemakers since they are also very safe with the children in the house where you don’t have to think about what would happen when if the kids in the house get hold of these Magic Openers. They will certainly not hurt themselves in any way since these openers are very safe. The ladies can easily find them at any point of time without looking much since their magnetic nature can be easily used to store them or place them on the top of various metal surfaces. During your BBQ outings these can be easily taken along in your handbags and used at the particular point of time.